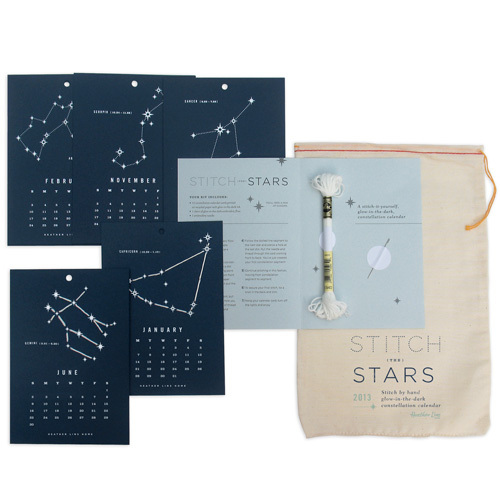 [BB-Blog]: Stitch the Stars 2013 Calendar Kit. Stitch the Stars 2013 Calendar Kit. As a slightly more grown-up version of my stitch-card-loving younger self, I'm kind of in love with these. 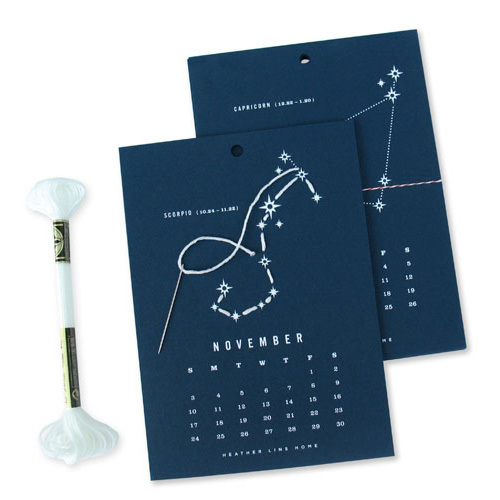 Each month gets a glow-in-the-dark printed card; each card features its corresponding constellation (i.e., January is Capricorn). Using the glow-in-the-dark embroidery floss (it really works!) and the provided needle, simply poke and stitch to connect the dots, completing the constellation. Hello, I love this calender.. Is it possible to buy somewhere? Do you send it? Well, I am in Turkey..
@Ann-Thannath: follow the link above..